The truth is that the Knight of Cups is the most feminine amongst all the Knight cards in the tarot. It's important to note though, that this doesn t even slightly suggest that he is any less of a worthy knight. It implies that he is in proper touch with his emotions and his intuition, and that he uses them for his own well-being and during his many romance and seduction quests. He is usually quite attractive and charming to others, regardless of their gender. When faced with an actual decision, the Knight of Cups is going to listen to his heart, regardless of whether this is actually a logical choice or not. He can also manifest as an event or a person in your life, or a part of your own self. He appears as a messenger – and with him, he carries an invitation or an arrival of something or someone which is going to have a certain emotional benefit for you. As a knight, he is also charged with taking the gifts of his suit, and bringing it outward into the world. He therefore can also represent the undertaking of some project with significant emotional or creative value for you. He appears as a messenger – and with him, he carries an invitation or an arrival of something or someone which will benefit you. Now that you are aware of the upright Knight of Cups meaning let s take a look at what the card says when it is upside down. Reversed, the Knight of Cups means that you allow your emotions to control your life a lot more than you should. You might be overly jealous, emotional or moody. In fact, this could get up to the point of actual incapacity to take action, which is most definitely to be avoided. 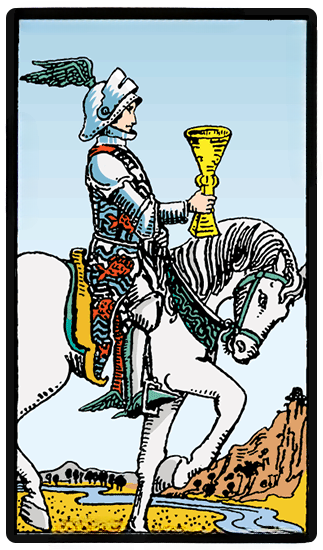 Jumping to conclusions too fast is characteristic of a reversed Knight of Cups, and making judgements without having the necessary information is very common. The card indicates a situation which could be considered appealing at first but quickly turns out to be something very different. With such high expectations, everyone will walk away quite disappointed.